The game drops players into a humongous whitish-grey cube that feels at first like a padded cell. Walls move, though, and spaces clear and the faceless and nameless (at least until the end) protagonist is in the hand of the player. A mysterious woman speaks over a one-way communication channel, telling the character how he must destroy the cube to save the world. This narrative touch distinctly separates “Q.U.B.E. Director’s Cut” from dreary puzzle games and places it more in the realm of “Portal.” The voice ushers the protagonist to a puzzle-filled chamber, which the player solves with telekinetic gloves. 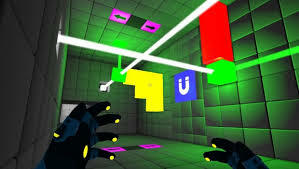 Differently colored squares can be controlled in various ways by the gloves to solve puzzles. For example, the player can extend a red cube up to three times its normal length, while yellow cubes come in sets of three and can be expanded into small staircase-looking structures. “Q.U.B.E. Director’s Cut” was released on July 21, 2015 on PlayStation 4, PlayStation 3, and Xbox One. The telekinesis mechanic is novel and well-implemented here, and the puzzle design sets a standard that other games daren’t dream of. The simple environments give way to fabulously brain-twisting riddles that feel genuinely satisfying to solve. New mechanics are introduced at a steady pace and never overstay their welcome. One frustratingly difficult puzzle had me navigating a sphere through a dark corridor in which I could only see one colored block at a time. Removing my visual advantage created a fresh way to test my skill with the gloves, and just when I finished a stress-inducing puzzle, that particular mechanic moved aside in favor of something I hadn’t seen before. Only a few times was I stumped on a puzzle for more than a few minutes. 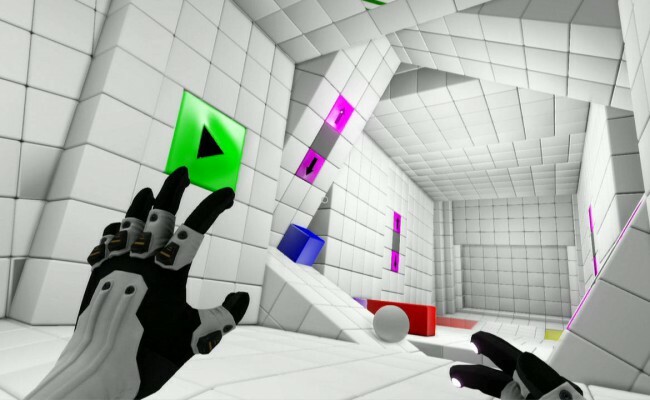 “Q.U.B.E” lends itself well to a trial and error method of puzzle-solving that feels rewarding. In my three hours or so with the game, I consulted a guide only once. “Q.U.B.E. Director’s Cut” was released on July 21, 2015 PlayStation 4, PlayStation 3, and Xbox One. The aforementioned female voice is later joined by a tumultuous male who is quite apparently distressed. Known as “919,” he attempts to convince the protagonist that the woman is lying to him. Conveniently, neither really talks much unless the player is in transition from one area to the next. Further, while the stories are interesting at the very least, they have no impact whatsoever on gameplay. Choose to believe the mysterious lady orbiting Earth in a spaceship or the strange crazy man fro who-knows where, and the game will still play out the exact same way. By the end, I thought of these story elements as superfluous, but well-written. A more personal connection or presence in the game would have made a load of difference in building a narrative. As it stands now, it is good but forgettable. It does leave one ambiguous detail open for debate if you pay close attention, though—attentive players will draw some fun conclusions. “Q.U.B.E Director’s Cut” earns a rightful place in the pantheon of puzzle games. It’s tricky, fun, and has a well-constructed narrative that doesn’t beg for attention, but also doesn’t enhance the gameplay. Still, choose to play for the puzzles, the narrative, or both, and you will have chosen well. “Q.U.B.E. Director’s Cut” developed by Toxic Games, was reviewed on PlayStation 4 and is also available on PlayStation 3, PC, and Xbox One. The game was released on July 21, 2015 and is rated “T” for teen.